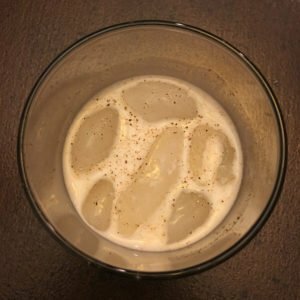 It was basically a White Russian with rum instead of vodka and nutmeg on top. Well the book sucked, but I knew the drink had Kahlúa in it, so I figured it had to be better than the book. So anyway, the drink was good. Ish. Kinda basic – nothing too exciting. But I finished it quickly and before the opening credits, paused the show to ask Chris to make another one without the nutmeg. The nutmeg just distracted from the creamy-kahlua-y-rum-y mixture. Love in the Time of Kahlúa, Take 2 went down just as quick and I enjoyed it more sans nutmeg.